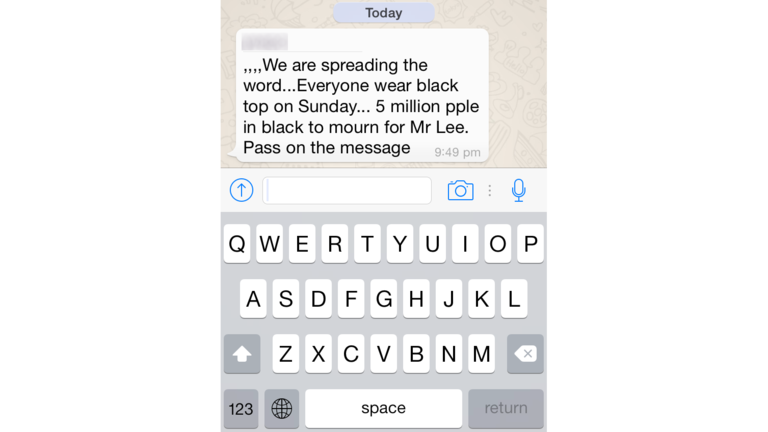 SINGAPORE: Messages urging people in Singapore to wear black on Sunday (Mar 29), the final day of mourning for Mr Lee Kuan Yew, started circulating on Whatsapp, social media, and via email on Tuesday. The movement aims for 5 million people to don the sombre colour as a mark of respect for the late Mr Lee, Singapore’s founding Prime Minister, who passed away early Monday. “We are spreading the word … Everyone wear black tops on Sunday … 5 million people in black to mourn for Mr Lee,” read the message.